October 1st, 2016 was designated as the very first National Ghost Hunting Day. In celebration of this new holiday there was to be an event like no other – one that would reach far beyond the confines of the United States. This was to be the night the Haunted Housewives, along with dozens of other ghost hunters, participated in The World’s Largest Ghost Hunt. Over 70 ghost hunting teams from all over the U.S. and several European countries would simultaneously conduct a guided paranormal investigation. Each team would represent a haunted venue and live stream their entire investigation on Facebook for all the world to see. The teams were joined by participants who paid a small fee which was donated to local animal shelters. This unusual holiday came about as an idea, a dream, that turned into reality with a lot of help from the paranormal field. The good folks at Haunted Journeys brought the idea to the powers that be at Scarefest – one of the nations largest paranormal and horror conventions held in Lexington Kentucky. In cooperation with a multitude of ambassadors and dedicated enthusiasts, paranormal investigator Brian J. Cano (Haunted Collector, Destination America) was picked to lead the charge and organize this monumental world-wide event. His celebrity and reputation helped spread the word about WLGH. This was no small task. Logistically, Cano had to unify hundreds of ghost hunters, haunted venues, and the curious public to pull off this complicated feat. The ghost hunt began with a bang – literally – a shotgun start at Scarfest. The Haunted Housewives were one of the teams leading an investigation. Our chosen venue was Farnam Manor in Richfield, Ohio. Farnam is a historic gem nestled in northeast Ohio with an incredible array of paranormal activity and lively spirits. Our previous visit introduced us to the ghosts of Emily and Everett Farnam and we were anxious to return. The Farnams’ is a tale filled with tragedy and hardship, interspersed with moments of love and happiness. The property on which they built the manor house dates back to Ohio’s earliest inhabitants. The Native American tribes that lived in the area considered it sacred. There is a special Indian marker tree on the property. This was said to guide the natives as they traversed the land. Today Farnam Manor is a historic living museum with a paranormal reputation. Ghost hunts, lantern tours, and various gatherings are held at Farnam. It is also a fantastic venue for a brunch, bridal shower, or other “non-paranormal” type gatherings. But it is the ghosts that keep the doors open. Farnam Manor was an excellent choice for inclusion in the World’s Largest Ghost Hunt. The night began with instructions to ask the spirits to communicate via ITC (instrumental trans-communication) using audio recorders. EVP (electronic voice phenomenon) sessions commenced simultaneously with all teams asking the same series of questions. But this was no ordinary EVP session. Participants were asked to concentrate on the questions being directed to entities known as the Technician and Conductor on a metaphysical plane called the Timestream. (This refers to a little known paranormal experiment conducted in the early days of paranormal research.) The hope was that we would combine our efforts and communicate with these specific beings. This was a collective consciousness experiment called “The Bridge”. Could hundreds, maybe thousands of people all thinking about the same thing at the same time have any measurable effect on a paranormal investigation? Could our combined energy, our intent, be enough to cross the veil between worlds? In all honesty, I think attempting to connect with the Timestream was a bit vague and ambitious. I’ve been in the paranormal field for decades and was unfamiliar with the Technician or the Conductor. But I was certainly willing to try a collective consciousness experiment using Instrumental Trans-Communication. We began our ITC session as instructed. I turned on the recorder and read the question aloud. Those that joined us eagerly gathered around and dutifully concentrated on the questions. We waited for 60 seconds before stopping and playing back the recording. My partner Cathi was also running a recorder so we had two files to review. We repeated the series of questions twice. The EVPs we captured were amazing. When we asked about the Timestream we did receive messages. Strange voices were captured on our digital recorders. Was it the Conductor? Did we contact one of the stations still operating on the other side? I would love to go on record and say that we cracked wide open the door between our realm and the next, that these voices were confirmation, but I cannot. One of the questions posed to the spirits was, “How do you experience time?” We didn’t get any intelligible response to that particular question, just some low muffled sounds. But the fact that we got ANYTHING on the recorder was remarkable! Well, that certainly was interesting! Once our required line of questioning was over, we were free to conduct our own investigation. We still tried to have everyone participate and concentrate on each session en masse. The collective consciousness idea was working! We then switched our focus to the local haunted inhabitants. Emily was the name of Everrett Farnham’s daughter who, as a young girl, fell into a cistern and drown. Over all we were thrilled with the results of The Bridge. Was the experiment a success due to the collective efforts of thousands of willing minds all concentrating on the same thoughts at the same time? Maybe. Or maybe the spirits were just feeling chatty. The World’s Largest Ghosthunt was by all accounts a huge success. Many teams captured EVPs or recorded ITC sessions with answers to the provided questions. The Bridge was crossed. The final tally of ITC sessions and EVPs are still being tabulated. Its a monumental task quantifying the submissions of each team. Hours of review and transcription is required. 2016 was the trial, the prototype of the event. Not everything went according to plans, There are kinks and technical issues that will need to be addressed next year but the idea was solid. The spirit of the experiment was honored. Everyone came out a winner. The biggest winners of the night were the dozens of animal shelters that received the donation bounty. Another secondary benefit went to the various venues that hosted the World’s Largest Ghost Hunt; in our case Farnam Manor. This important historic site was, for one brief moment, in the national spotlight. Hopefully the publicity and awareness will translate into future visits by those in the paranormal community, which in turn will generate much needed funds. Historic preservation cannot happen without a monetary component. Like many haunted venues, Farnam Manor is in desperate need of income to keep up with the preservation and restoration needs. Once slated for demolition, two of its former volunteers took a leap of faith and purchased the property in efforts to save it and its historic designation. Now their efforts combined with The Haunted Housewives and those involved in NGHD will make a significant difference in the future. This is just the beginning. With any luck, the incredible results of the first National Ghost Hunting Day will fuel the fire for next year’s event. With Brian Cano at the helm and Scarefest as our mothership, we hope to see a bigger, better, more refined event in future years. With a bit of luck and a touch of tenacity The World’s Largest Ghost Hunt will spill out of the shadows and into main stream media. National Ghost Hunting Day is long over due in my eyes, regardless of whether your believe in the paranormal or not. A day set aside to recognize the tireless pursuits of those in the field will help validate our work. In the past decade the topic of ghosts and the supernatural have gone from hushed whispers to loud proclamations. And when National Ghost Hunting Day becomes International Ghost Hunting Day, the Haunted Housewives will be ready – aprons on, recorders out! For many of us that’s an easy question. Either we do, we don’t, or we sit teetering on the fence between belief and non-belief. A large majority want to believe but maybe haven’t had that one mind-blowing event that’s put them over the edge. They are very skeptical, but they believe in the possibility. Skelievers – skeptical believers. Others feel it goes against their scientific or religious dogma. They find it difficult to believe in something they cannot quantify, or too bound in faith to accept anything that contradicts their religious doctrine. My own family fell into the latter category which made my fascination for the occult a sin in their eyes. But, as they told me in church, Jesus died for the sinners. One topic that puzzled me was the idea of a soul. A soul is what separated humans from all other of God’s creatures, even angels. A soul was our spiritual center, our connection to heaven, our ticket to the afterlife. Without a soul one could not enter the kingdom of God. There are other requirements as well but I don’t want to get into that right now. I accepted the idea of a soul just as I accepted the idea of a conscience. My issue with the concept was the exclusiveness. Humans had souls. Animals did not. Are there animal ghosts? What happens to their souls after they die? Can our pet’s spirit live on after bodily death? What kind of heaven doesn’t allow cats and dogs in? My priest, my teachers, and my family assured me that animals were soulless and therefore not permitted beyond the pearly gates. Saint Peter had his orders. But why can’t an animal have a soul? They have emotions, after all, and experience many of the same feelings we do. Anyone who’s ever had a loyal dog can attest to this. Some scientists may disagree, but they’d be hard pressed to convince pet owners that their furry family members don’t convey many of the same emotions as humans do. Fear, joy, anger, anxiety, love, and even shame. The greatest of these emotions is love. Animals love. If love is the bond that ties our spiritual being to the physical world, then why wouldn’t an animal be tethered to it as well? Are we responsible for holding these connections with our pets after death, or is it the will of the animal to remain with us? 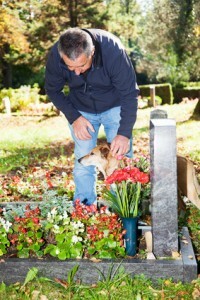 Stories of dogs who refuse to leave the graveside of a fallen master come to mind. Dogs who won’t eat, or seemingly lose the will to live, apparently overcome with sadness are thought to die of a broken heart. Is there something biological going on here or is it an emotional response? Animals are mysterious, complex creatures. We can’t ask them what’s going on in their head. We can’t analyze their feelings in the context of an abstract idea like love. We can, however, interpret their behaviors, and those behaviors tell me that they can feel emotional pain and loss just as we do. Love and loss are popular themes in hauntings. Some ghosts stick around waiting for their loved ones to join them. Others are so heartbroken they can’t seem to move on. The sudden loss of life can be unacceptable for both the living and the dead. Some feel love so strongly they refuse to leave a spouse or family member behind. I believe these emotions are not reserved for humans alone. Other emotions that fuel hauntings are anger or hate. The flip side of love can be a very powerful feeling. Heart racing, blood boiling, teeth grinding anger that turns us red hot and out-of-control. It can be a palpable energy that resonates after death. There are plenty of stories of hell hounds, devilish creatures, evil, vengeful animals that terrorize the living. But our pets? Hopefully, Fido wasn’t in a bad mood when he passed. I have encountered many animal spirits in my investigative work. One of my very first residential cases was a puzzling dilemma. The homeowner felt as if he was being visited by a nefarious demon and was scared to be alone in the house. He thought an exorcism was in order until we considered a far less terrifying explanation – a dog. The client reported strange growling noises, unusual smells, doors opening on their own, small dark shadows darting quickly across the floor, a cold wet sensation on his hand as it dangled over the bed at night. We deduced that it was the spirit of his recently deceased family dog who had a habit of rubbing his nose on his masters hand as they settled in to bed at night. When he realized the likely cause of the paranormal activity was his beloved canine, the client went from a real sense of fear to an overwhelming sense of comfort. My favorite local haunt is Willoughby Coal; a historic building that now serves as a hardware store. The ghost stories that emanate from this place could fill a book! Besides the numerous human spirits that dwell inside this unusual location is a legendary ghost of a dog named Yukon. Yukon was the favorite pet of a former owner who brought the dog with him to work every day for nearly a decade. The dog died after being hit by a train right outside Willoughby Coal. Workers and customers have continued to see, feel, hear, and smell him for more than a decade after his accident. The Haunted Housewives have encountered this ghost dog so often we consider him our unofficial mascot. Yukon is hanging out at the place he found most comforting and familiar; a place where he knows he is always welcome with people who will always remember him with fondness. The phenomenon of animal hauntings is nothing new. As long as there has been a belief in a spiritual realm there has been reports of these fascinating ghosts. Ancient Egyptians held strong beliefs that their souls continued in the afterlife. Pharaohs were often escorted into the afterlife with their earthly belongings, i.e., the elaborate tombs full of riches. These belongings often included a favorite pet…or slave. Both were often killed in order for their souls to accompany their master into the next realm. The ancients strongly believed that animals had souls, and therefore a place in the afterlife. The soul was often depicted in Egyptian art as a bird, a cat, or some other non-human figure. Native Americans were known for their belief in the connection between nature and man. The universe consisted of both a physical and a spiritual component that demanded a mutual respect for all living things. They held strong the belief of spirit animals – although not quite the same thing as animal spirits. The importance of nature and harmony with the whole of the universe was the very essence of their culture. Everything had a soul – people, plants, the wind. Everything had a part to play in the bigger picture. More modern examples of ghost animals can be found in accounts initiating from all over the globe. Some of my favorite come from the good old U.S.A.
One of the more well known animal ghosts is the so-called “Demon Cat” that haunts the Capital Building in Washington D.C. The spirit of this black feline is said to appear during times of great political strife, natural disasters, or the unexpected death of a president. Always elusive and always black, this cat has defied security measures for decades. Besides being spotted on the catafalque, the ghost frequently roams the dark corridors of the basement, terrifying unsuspecting guards that give chase. The apparition has been reported in the White House as well as other federal buildings in the capital. Is this ghost cat a demon, an evil spirit somehow responsible for the tragedy at hand? Or is it somehow a harbinger of death, a warning, a symbol of the change and chaos that accompanies its visits? Any history lover or elementary school student can tell you about Gettysburg, the most famous and arguably the most important confrontation of the American Civil War. In July 1863, Union and Confederate soldiers littered the small Pennsylvania town with bullets and blood. Over the course of three days Gettysburg saw more than 50,000 casualties; 50,000 men captured, wounded, or killed. An epic battle like that leaves a stain. The death toll was unparalleled and the suffering immeasurable. If there was ever a recipe for a haunting, this was it. Paranormal enthusiasts believe the battlefield and surrounding town are notoriously haunted. The hotels, B&Bs, museums, and even the national park have countless stories of ghostly encounters. Residents and visitors have seen soldiers in full regalia, still fighting a war that ended over 150 years ago. Many of these spirit soldiers are spotted on horseback. Are these just residual hauntings replaying like a broken record? Are they just a memory or are they “stuck” along with their riders as some paranormal experts believe? Horses are not the first thing that comes to mind when you think of animal spirits, but when you factor in the importance of these creatures to the soldiers, it just makes sense. St. Louis is one of my favorite cities in the United States. The people are always friendly and the beer is always cold. One of the most intriguing reports of an animal ghost originates from the Lemp family, once considered St. Louis royalty – beer moguls who’s lives and deaths captivated the country. The Lemp family mansion sits proudly as a restored tribute to this fascinating clan. The Lemp story has everything – rag to riches to obscene wealth, mystery, love, betrayal, tragedy, suicide, curses, and ghosts! After four (yes four) members of the Lemp family committed suicide there was bound to be a few hauntings. The Lemp Mansion is definitely one of the most haunted places in the country, replete with ghosts. According to legend and eye witness accounts, one of those ghosts is a dog. Charles Lemp, the fourth and final Lemp to commit suicide, had a pet dog named Cerva. Charles decided to end his life in the same method that his father, brother, and sister did before him. He believed his beloved furry companion would be too distraught to live on without him, so he shot the dog before turning the gun on himself. Cerva is reported to be one of the most common of the Lemp Mansion ghosts, especially fond of the room were he met his tragic end. His wet ghostly nose nuzzles guests as they sleep. His sorrowful howl echoes through the mansion on the anniversary of his demise. The spirit of Charles Lemp is often spotted in the upstairs guest rooms. Loyal in death as he was in life, Cerva always accompanies his master. A familiar story of animal hauntings comes from the Crescent Hotel in Eureka Springs, Arkansas. The magnificent hotel is notoriously haunted by the victims of an evil doctor who scammed unsuspecting cancer patients. The sick put their lives and their life savings in the hands of Dr. Baker whose treatments did more harm than good. The tales of ghostly encounters at the Crescent are nothing new. One would almost expect a place like that to be haunted. But recently, stories of a different kind of ghost have surfaced. The spirit of an orange tabby cat has been spotted roaming the halls of the luxury resort. The cat is thought to belong to one of Baker’s many victims. Maybe the cat is seeking the comforting arms of its former owner before crossing over the rainbow bridge. My favorite animal ghost story comes from a place I’ve frequented numerous times and a spirit I’ve encountered often. Tucked away in a quite little town called Linesville, perched on the border of Ohio and Pennsylvania is a quaint, unassuming, yet utterly charming place known as the Knickerbocker Hotel. The hauntings date back to its early incarnation as the Arnold House, a place to fill your belly, raise your glass, and rest your head. Over the decades, the Arnold House collected memories and stored them in the weathered red brick foundation, locking them away them like a family treasure. Today the building is the home and heart of Merle and Peg Knickerbocker. They keep safe the ghosts of those who graced the halls of their magnificent venue, protecting them from anyone who tries to exploit or disrespect the dead. One of the most beloved spirits that dwell the antiquated halls of the hotel is a ghost kitty. The cat, another orange and white tabby, has been haunting the Knickerbocker since Merle and Peg took ownership. Its origins are unknown but its presence is the more prominent of all the spirits that live at “The Knick.” Guests reported the familiar sounds of a cat, purring and meowing in empty rooms. Countless EVPs (electronic voice phenomenon) have been captured of the unmistakeable meows. I have personally heard the phantom feline on numerous occasions, both with my ears and on my recorder. The ghost kitty has been immortalized at the hotel in a display that shows the screen shot in question, along side of a picture of a real orange tabby cat that once stayed at the hotel. There is a room, replete with toys and trinkets, named in honor of the ghost kitty. 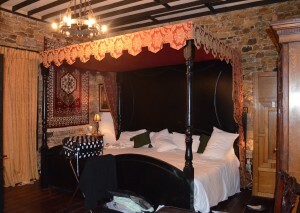 It is my favorite room in the hotel and undoubtably one of the most haunted. Where did this ghost come from? Who’s pet was it? Why is it still hanging around the Knickerbocker? We may never know the true origins of the cat but this one is a keeper. No feeding necessary, no shedding, no fleas, no litter box. As far as the owners are concerned, ghost kitty is welcome to stay. The stories of animal ghosts are endless, the encounters compelling. It seems some animals do live on in spirit form after death. Is it their choice or our need that keeps them in our earthly realm? That question will remain a mystery. I for one am relieved to know that our pets, like our loved ones, will be waiting for us in the afterlife. Who would want to live an eternity without them? They are part of our universe. They are part of us. On my recent trip to Ireland, I arranged to visit a place high atop my bucket list – Charleville Castle. The castle was built in 1798 for Charles William Bury, Earl of Charleville, a strange and eccentric man of wealth and power. It was designed by famed architect Francis Johnston, a freemason, known to be a practitioner of the dark arts who performed black magic rituals inside the castle walls. 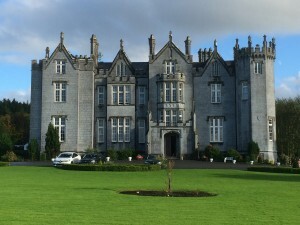 Charleville Castle is known as one of the “Scariest Places on Earth” and featured on the thus named reality show back in 2001. The aforementioned program presented Charleville as an ominous and creepy structure that would illicit nightmares from those with even the strongest constitutions. 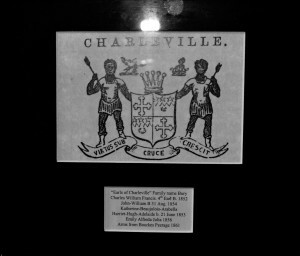 Charleville was a place said to be “infested” with ghosts. Charleville Castle took 14 years to complete. It was a prime example of indulgence, excess, and obscene wealth. The Earl’s lavish parties and grand gatherings made the castle a happy, lively place to be. So why is it so replete with petulant spirits? In the case of Charleville, it might be that the land as well as the building is haunted. 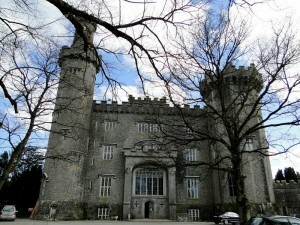 The castle is located in Tullamore, County Offlay, the geographic middle of Ireland. Legend states that the castle was built on an ancient faery mound, an act that evoked much anger from the mythical Irish beings. The mile-long road leading up to the front door of the castle cuts through a large swath of old-oak forest. The thick blanket of trees mask dark supernatural secrets. Creatures that hide in the woods by day come out in force once the sun goes down. The eerie residents of the forest add to the haunting reputation of the magnificent castle. The ancient forest was a place of great power. Druids built sacred burial grounds in the area. Monastic monks revered the land for its mystical properties. For centuries, these mysterious cloaked figures have been spotted in the forest, performing strange rituals by moonlight. Much to my surprise the 55,000 square foot Charleville was not a gloomy fortress of doom, it was surprisingly beautiful, at least during the day. Considered the finest neo-gothic castle in all of Ireland, Charleville was a “faux” castle; designed as a show piece with little or no practical military applications. At first glance, the reputation and reality of the castle seemed to be a paradox. Time and weather have not been kind to Charleville. Looted, pillaged, and neglected for decades, only recently has the property been rescued. The current owner is in the process of slowly and painstakingly restoring the fabulous castle. Only a portion of the castle is structurally sound. Most of the top floor is still dangerously dilapidated, but the open areas are breathtakingly beautiful and architecturally impressive. During my visit I toured various dining and drawing rooms inside the castle, including the three paranormal hotspots. The Queens Chamber, a magnificently restored round bedroom, is thought to be the most active sleeping area in the castle. The spirit of a woman has been spotted floating near the elaborately carved mahogany bed on several occasions. She’s been known to sit, leaving an impression on the mattress. She’s even tried to join guests under the covers while they slept. After introducing myself, I tried to engage the ghost in conversation with a short EVP session. “Is there a woman here in the Queen’s Room who’d like to be acknowledged?” I asked aloud. 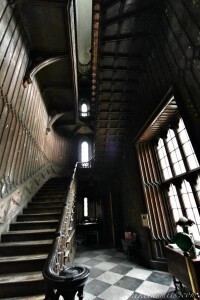 After that, I made my way to the servant’s staircase on the opposite side of the castle. The ghost of an eight year old girl named Harriet, daughter of the Earl of Charleville, was said to haunt the stairwell. Harriet died in 1861 after falling and breaking her neck while playing on the stairs. Wispy shadows, girlish giggles, and forlorn screams are attributed to Harriet’s ghost. The current owner’s children often played with Harriet, who became reclusive around adults. 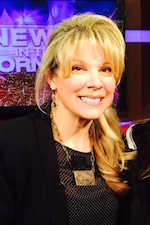 Finding Harriet has been the focus of many paranormal investigators, including teams from SyFy’s Ghost Hunters International and Living TV’s Most Haunted. I tried my luck at coaxing Harriet with my motherly ways. I spoke of my son who was about her same age, hoping she would show herself or let her voice be heard on my recorder. While reviewing the audio file, something unsettling happened. I felt a sudden burst of cold air brush across my neck, as if someone with icy breath was blowing near my ear. I shuddered, caught off guard by the change in temperature. I looked up just in time to see a dark, ominous shadow standing at the top of the landing. It had a distinctively human form, appearing slightly taller than the bannister in front of it. Within seconds, the shadow quickly darted off to the right, moving at unnatural speed. Had I just witnessed Harriet? My instincts told me something paranormal was happening. Leaving the stairwell, I made my way into the King’s Chamber – the 18th century equivalent to a modern “man cave” minus the 56 inch flat screen TV. Ceremonial swords, armor suits, elaborately decorated chairs, hunting trophies, books, and various bric-a-brac covered every square inch of the round cornerless room. I felt overwhelmingly uncomfortable. The atmosphere was heavy and caustic, almost smothering. This was no place for a woman – living or dead. As I walked the interior of the King’s Chamber I tried another EVP session. I asked for a sign that I wasn’t alone. Another cold breeze rushed across my face, but this time it was strong enough to move the hair off my forehead. I whipped around expecting to find a window open but they were locked securely. My body shuddered with excitement and dread. The response was chilling. I picked up an EVP of a loud, angry scream. It was a masculine voice full of emotion and intent. I kept my promise and quickly left the room. It was most definitely time for my investigation to end. That concluded my exploration of the castle and I made my way back down the wooded path. The late afternoon sun fought hard to get through the thick forest canopy, making the journey down much more ominous than the trip up. The time I spent at Charleville was brief but eventful. The castle had a multitude of secrets, as did the land. Ancient and esoteric, the forest was a place of enchantment that surrounded Charleville like a mystical blanket, keeping sacred mysteries safe from the modern world. Does Charleville Castle deserve the title of one of the “Scariest Places on Earth”? I can’t say for sure. But there is a magical element to this young Irish castle that can’t be labeled as any one thing. I can veraciously describe Charleville as a paradigm of paranormal phenomenon. The Haunted Housewife’s Holiday Paranormal Gift Guide 2015 – a gift guide for all paranormal enthusiasts and those who love them! Beware the holiday blues! Don’t be a Scrooge and risk a visit from Krampus. Make sure everyone is happy this holiday season by stuffing the stockings and packing the tree with gifts they really want. No matter what your budget, you’ll find something for all the most unique and interesting people on your list! When thinking of gifts, think outside the box! Books and subscriptions! Jim Harold’s Paranormal Plus Club – get access to exclusive “members only” extras, podcasts, webinars, and special features offered via subscription by Jim Harold. Coast to Coast AM Insider – a small monthly fee gets you more of the paranormal programming you love, including access to past shows and live streaming. NOTES: All prices are as of 11/24/2015. Subject to change. This article includes multiple affiliate links which benefit Jim Harold Media LLC. Thanks for your support! One of the most challenging obstacles ghost hunters face is navigating through the muck and mire of the paranormal world. They must weed through each report and rule out natural explanations, misidentifications, psychological front loading, embellishments, and intentional hoaxes. The reports are many but the true hauntings are few. Unusual doesn’t necessarily mean paranormal. The power of suggestion and expectation can create the illusion of a paranormal occurrence where nothing abnormal exists. In a sense, we can create ghosts. The reverse is just as misleading and far more devastating to those who believe. Destroy the idea and you kill the ghost. Not in the Sam and Dean Winchester Supernatural salt-and-burn-the-bones kind of way, but destroy it nonetheless. In fact I have killed many ghosts. To kill a ghost you must first understand how they are created. You must be able to decipher between what is natural, supernatural, and psychological. Our minds can take an idea and give it life. We conjure this ghost, give it power by our belief, wishing it to be true – like a tulpa or though form being. Although unintentional in many cases, sometimes this process is deliberate. Certain reality television shows who need a ghost to be real will often do this. They take an odd occurrence, develop it into a mystery which in turn grows into an enormous legend, twisting the truth to fit a colorful story, and add a dash of skewed history for authenticity. Viola! Now they’ve created a ghost! One thing that helps this type of ghost “live” is the power behind the belief system. A legend grows with every telling of the tale, with each reported encounter, and every attempt at communication. This, in theory, is why places like The Ohio State Reformatory or Waverly Hills Sanatorium are said to be so haunted – the constant “calling” of the spirits by visitors and the expectation of finding a ghost. Not all ghost hunters do much original research. Instead they hear the legends and expand on what others have done before them. If the accepted story is that the ghost of a little boy named Timmy haunts the halls of a famous abandoned TB hospital, then most investigators use that information as a starting point. They’ve heard the stories, the EVPs, seen the fuzzy dust filled photographs, and just go with it. They continue along this train of thought and expect to find Timmy. How do they know for sure it is Timmy? How do they know it’s even a child’s spirit? The truth is, they don’t know with whom or with what they are communicating when conducting a paranormal investigation. What if the original story was wrong or made up? What if Timmy never existed? What are people seeing and communicating with? The facts don’t always deter the phantoms. If history proves there never was a Timmy, then what is happening? Is the ghost answering to a name because it’s desperate to communicate? Has it been called or beckoned from somewhere else? It may be a ghost, but it may not be Timmy. Killing a ghost is like peeling an onion; every time you replace a myth with a fact, another layer is removed. The sharp knife of accurate historical research cuts through the paper-thin skin holding the story together. Fact checking property deeds, death records, newspaper articles, eyewitness interviews – these are the weapons I use in my quest to kill ghosts. With every discovery of an inaccuracy, embellishment, or unreliable source, I spill the blood of the imaginary apparition. I found that killing a ghost can be a delicate matter. People love their ghosts. They cling to their stories like a lifeline to the afterlife. The legend of Lily keeps ghost hunters flocking to the Trans-Allegheny Lunatic Asylum in droves. If someone was to prove that Lily never existed, that there is no tortured child spirit roaming the halls of the defunct mental hospital, then paranormal enthusiasts might choose to spend their evenings and their money elsewhere. When researching my first book (America’s Most Haunted: The Secrets of Famous Paranormal Places) I unexpectedly discovered the dangers of phantasmicide (I just made that up.) Paranormal venues that rely on their reputed ghosts to bring in visitors and revenue get very testy when you debunk their resident spirits. The reputation and personalization of the hauntings makes them very real. Giving them a name and a backstory gives them life. Taking that element away destroys the legend and destroys the ghost, and that’s bad for business. Residential cases are similar. Strange happenings plague the family. The kids are talking to invisible entities, strange rapping noise are echoing through the hallways at night, eerie cold spots appear out of nowhere, or there’s an unshakable sense of being watched. They believe they have a ghost and they want someone to come investigate, expecting the investigators to produce a full blown apparition for them. In these cases, it’s like fighting an uphill battle. The family truly believes their house is haunted and they want someone else to believe that as well. They don’t want to hear a rational explanation for the strange noises or smells they’re experiencing. They are not interested in a contradictory opinion. They want more than anything for someone to believe them. If told they have an unsafe level of EMF leaking from their breaker box, or a family of raccoons living in their attic, or they need to up their medication, they get angry. The very last thing they want to hear is that there is no ghost. Most of the time, people don’t want reason and logic – they want validation or attention. They are offended at your findings. They are more upset when you disprove a haunting than when you tell them there’s a demon in the closet. When you kill a ghost, you kill part of the family. You kill a piece of their reality, their sense of judgement, their ability to know fact from fiction. You are suggesting that they are wrong, disillusioned, or psychologically damaged somehow – or worse that they are just average, normal, boring. Their home is not haunted and they don’t have a ghost. They are not special. For many that is a bitter pill to swallow. Think about the term “ghost hunter” and what that means. To hunt something is to capture and often kill it. Hunting a ghost, whether it be real or imagined, can lead to its literal and figurative death. Again. Sometimes a ghost is real, sometimes a ghost is imagined, and sometimes we can make a ghost real with the power of our imagination. Keep that in mind next time you embark on a paranormal investigation or watch your favorite ghost themed reality show. The perception is the reality, both on the physical and the metaphysical plain. Beware of ghosts, but also be aware of your power to create and destroy them.